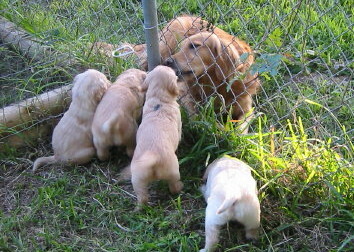 At Vintage Goldens, we take puppy raising seriously, and we love raising puppies. 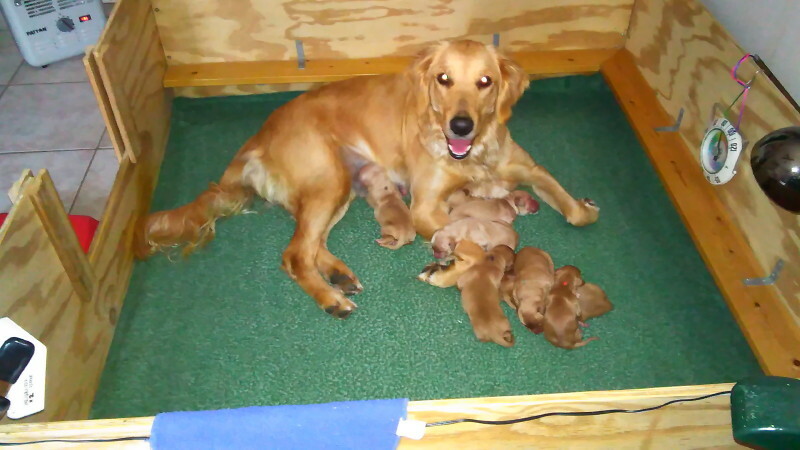 Our goal is to produce puppies that are confident, happy, healthy, and well socialized. We want to give them as much head start as possible toward their various life jobs in hunting, performance competition, search-and-rescue, service and assistance work, and most important as companions. We seek to find a balance between raising puppies in a safe, nurturing environment, while at the same time encouraging them to be bold, curious, and to expand and challenge their horizons every day. We provide an environment that stimulates all their senses and constantly provides learning and problem solving experiences. Puppies are whelped in our "puppy room" in our home. They spend their first 2.5 weeks in the whelping box. For identification, each puppy is marked with a dab of nail polish on the shoulder, each a different color. Pups are weighed daily, making sure each is thriving. Starting at one week age, toe nails are trimmed weekly. At about 2.5 weeks age, puppies' eyes are open, they are learning to walk, and their ears begin to open. At this point, they are ready to start expanding their world. 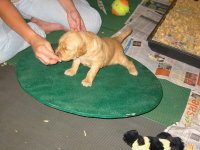 We open up the front of the whelping box, and use a wire x-pen to create a larger puppy play area. 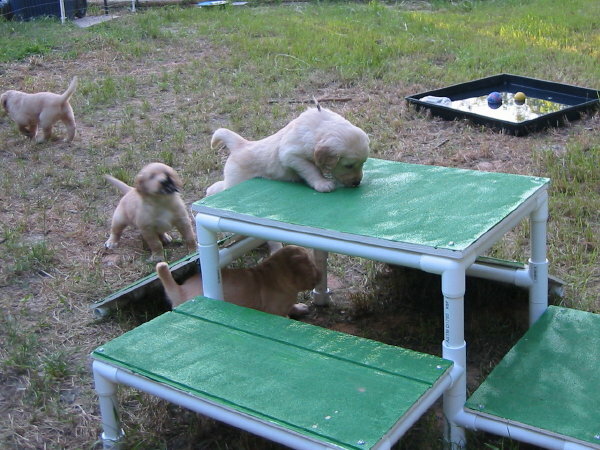 Toys and an Adventure Box are added to give the puppies "obstacles" to negotiate as they move around. a Puppy Sounds CD. Puppy Sounds has tracks of a variety of sounds a pup might encounter in their adult life: cars, lawn mowers, kids playing, children crying and screaming, air planes, gun shot, fire works, dogs barking, animal noises, etc. 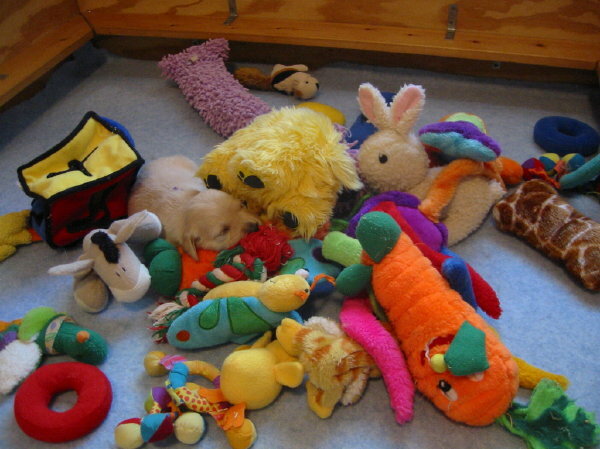 As we interact with the puppies and move around the puppy room, we make a point of being noisy! Metal food bowls are dropped (on purpose), doors are slammed, etc. We know our puppies will live in a busy noisy world, and we want them to grow up accustomed to and comfortable with sound. CLICK here to view a video of 3 week old Harley exploring the Adventure Box for the first time. 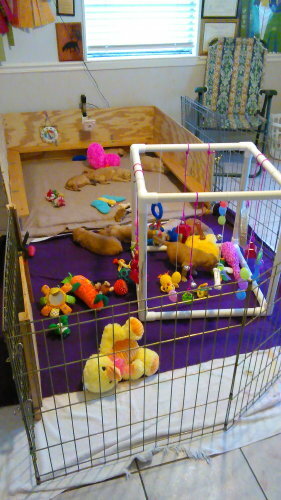 By about 3 to 3.5 weeks age we find the pups spend most of their time out in their play area, out of the whelping box. At this point, we take the whelping box away, and use a wire x-pen to contain the puppies. We introduce 2 crates into their space, one plastic and one wire, so they get used to both types. Fleece pads are put in each crate, for them to sleep on. A blanket outside the crates also provides warm sleeping space. 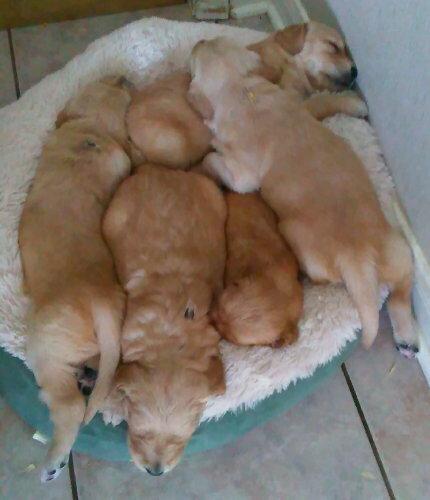 A small dog bed is placed in the area, as we've found the pups love to snuggle in it. 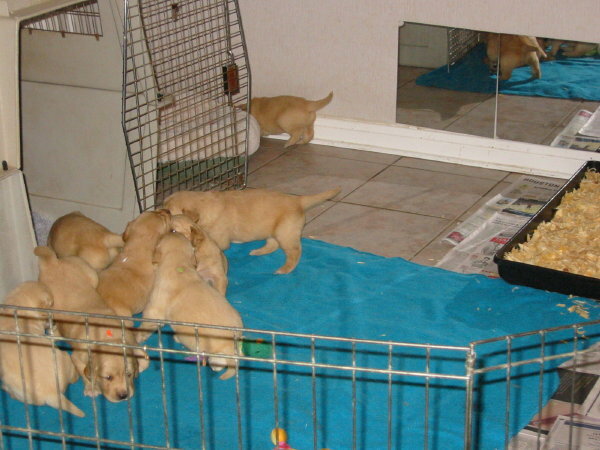 A number of small puppy crates are used to provide the puppies with brief individual crate time while the room is cleaned and mopped each day. We introduce a tray of wood chips (pine shavings), in one corner of the area. Now begins the process of "potty training." Any time we spot a puppy about to potty, they are placed on the wood chips. When they are taken out of crates after room cleaning, they are placed on the wood chips until they potty. Typically by about 4 weeks age, they figure it out and they start to go to the wood chips to relieve themselves. Until that age, the enclosure is kept small so the pups are never far from the wood chips. Once they start to potty on the chips, we gradually increase the size of the enclosure, moving the wood chips further from their sleeping area, eventually adding a second wood chip tray. 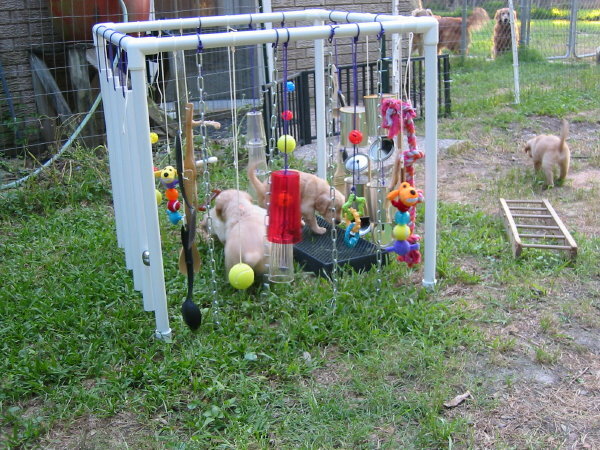 As the pups grow and as their enclosure grows, more toys and play equipment is added. Boxes and step stools to climb on, tunnels, toys of all sizes and textures. LOTS of toys! Eventually the puppies have the whole room for their living space. 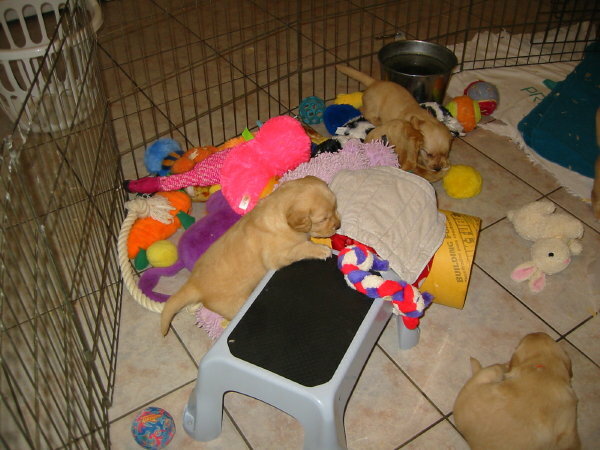 CLICK HERE to view a video of a litter of 6.5 week old puppies playing in the puppy room. Keep your eye on the white box in the center and wait for it! 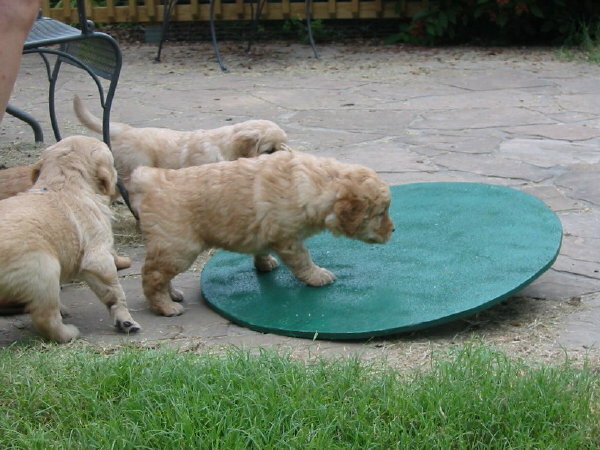 At about 3.5 weeks age, once they are walking fairly well, we begin short workouts on the wooble board. This helps develop confidence, balance and motor control. For puppies going to working homes that may use scent work, we begin scent training at about 4 weeks age. CLICK HERE to view a video of a puppy identifying the metal tea ball with Anne's scent on it. Food reward is given when the puppy gives a positive indication of which is the correct, scented object. If we have a litter with pups going to train for diabetic alert service work, we do scent training with conditioning to low glucose scent, beginning from birth. At 4 weeks age, we take the puppies outdoors for the first time. 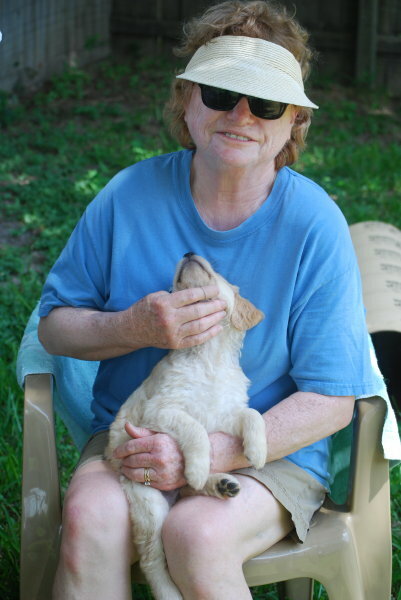 At this age we also start allowing our buyers to come play with the puppies. From this point on, we want the pups to get lots of interaction with as many humans of all ages as possible. 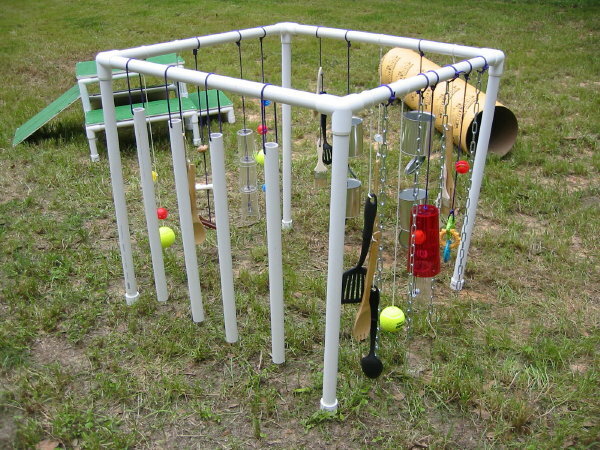 The large outdoor puppy yard has several pieces of play equipment designed to build confidence, nuture physical coordination and motor skills, problem solving, and just plain puppy fun! A larger adventure box, climbing platform, swing plank, and bottle pool provide hours of non-stop play! Don't tell the pups they are learning valuable life skills as they play! Interactions through the puppy yard fence with our other dogs provide the pups' first exposure to adult dogs other than their mother. At about 5 weeks puppies get their first introduction to birds. From weeks 5 to 8, we periodically test each puppy on dead pigeons, evaluating degree of interest, prey drive, and persistence at finding the bird. 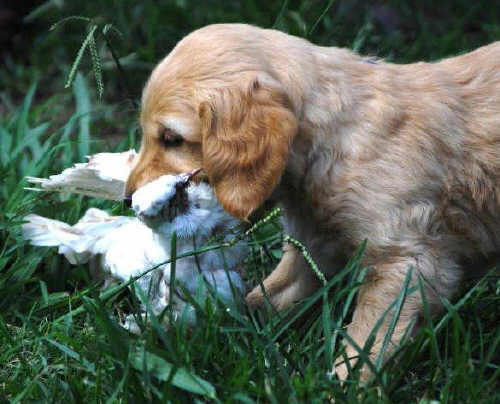 These observations are important factors in deciding which pups go to hunting/field homes. 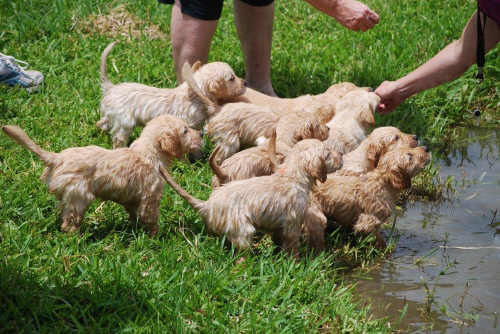 At 5 weeks we have a Puppy Party, inviting our buyers and their families to help take the puppies up to the ponds and swimming for the first time! At the end of all this, we pick which puppy goes to which home. Throughout their time with us, we are constantly observing the puppies, making notes and evaluating. We try to spend as much time as possible getting to know our buyers. We seek to make the best possible match between the characteristics of each puppy and the needs and expectations of each buyer. We strive to place each puppy with the home best suited for it, and to provide each buyer with the puppy best suited to them. Our goal is for each buyer to feel that they received The Best puppy of the litter! We do try to take into account each buyer's preferences for gender, color, or a particular puppy in the litter; however we do not make promises. Buyers are encouraged to get to know all the puppies in their litter and not set their hearts on any particular puppy. FEEDING: Our girls eat a home-made raw diet, supplemented with grain-free kibble as needed to meet extra calorie demands. This diet is continued during pregnancy and lactation. 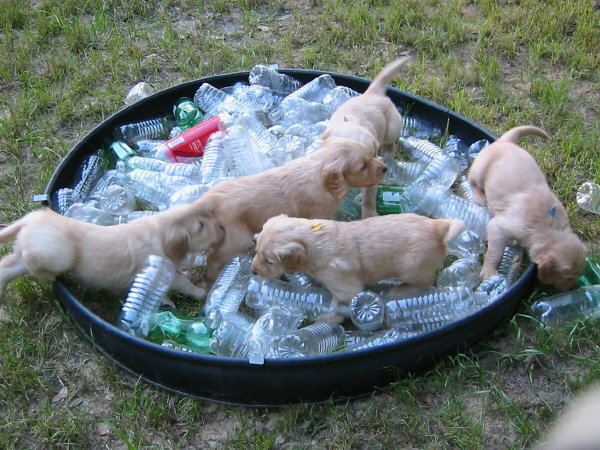 Puppies are weaned onto fresh raw foods, beginning at about 4 weeks age. From 4 to 6 weeks age, we begin decreasing the amount they nurse on their mother, as we increase the amount of solid food we feed. At 6 weeks age, the pups nurse for the last time. At this time, we begin to introduce some grain-free puppy kibble into their diet. Depending on whether their new homes are mostly going to feed kibble versus raw, we may continue the puppies on raw plus some kibble, or we may transition them to almost entirely kibble by the time they go home at 8 weeks age. When a pup goes home, the buyer is supplied with a gallon bag of the kibble the pup is used to eating, to get them started in their new home. WORMING: Pups are wormed at 3, 5, and 7 weeks age. VACCINATIONS: Puppies get antibodies against disease from their mothers. If the mother has been appropriated vaccinated prior to pregnancy, and her puppies nurse well, especially in the first 24 hours after birth, they should have maternal antibodies protecting them during their first weeks of life. Current research shows most puppies retain maternal antibodies until at least 8-9 weeks age. While a puppy has high levels of maternal antibodies, vaccinations will not be effective. Maternal antibodies must drop to low levels before a vaccine can take effect and provide lasting protection for a puppy. By 4 months age, most pups have lost their maternal antibodies. Between 2 and 4 months age, those antibodies are declining, but we don't know for any individual puppy at exactly what age a vaccine can become effective. That is why we give puppies a series of vaccinations, usually 3-4 weeks apart, through this time period. Current research is also suggesting there are risks associated with over-vaccination. We believe dogs should be vaccinated for necessary high-risk and serious diseases. "Core" vaccinations are rabies, distemper, adenovirus, and parvo. Other vaccinations should be given on an as-needed basis, assessing the risk of the indivdual dog being exposed to the disease, and the seriousness of the disease. We don't like to vaccinate our dogs for diseases they are unlikely to be exposed to, or use vaccines that don't work well, or for illnesses that are mild and not serious. We especially do not want to over-vaccinate our puppies. Based on current research, we feel the best age to start giving puppy vaccinations is 8-9 weeks. This is the age our puppies leave us and go to their new homes. For this reason, we do NOT routinely give puppy vaccinations to our litters. When a puppy goes to its new home, the buyer should take the puppy to their veterinarian within 3 business days, for a well puppy checkup. This is the perfect time to begin puppy vaccinations, as well as giving the first dose of heartworm preventative. For puppies going home after 9 weeks age, and/or those traveling out-of-state to a new home, we will work with the buyer to assess, and if need be, to vaccinate before the puppy leaves us.